Domantas Sabonis is among the nation's top rebounders. College basketball observers have spent two years searching for the proper words to describe Gonzaga sophomore Domantas Sabonis. Northern Arizona coach Jack Murphy may have provided the most succinct description to date. "He's an NBA player playing in college," Murphy said after Sabonis sank 12 of 13 shots and scored 26 points in just 18 minutes against NAU earlier this season. Murphy's complimentary exaggeration may become fact as soon as next season. NBA draft boards, for the second straight year, predict that Sabonis will be taken in the first round if he foregoes his remaining college eligibility. "I have no thoughts about that," Sabonis says. "I'm just thinking about this team right now." The Bulldogs (21-7) are scrambling to capture yet another West Coast Conference regular-season title after a 63-58 loss to Saint Mary's on Saturday night in Spokane. The team is looking to play their way into the NCAA tournament for an amazing 18th consecutive year, which might require that they win the WCC tournament next month in Las Vegas. Gonzaga wouldn't have a prayer if not for the skill, spirit and effort of Sabonis. "He's so open to coaching, and so receptive to it and hungry for it," coach Mark Few said after a recent practice at GU's McCarthey Athletic Center. "And then he's got this work ethic that's just insatiable. "The guy's going to give you everything he's got in practice, go 'ice up,' get something to eat, study a little bit and then come back down here at 9 o'clock tonight and start shooting with Wiltj [WCC scoring leader Kyle Wiltjer]. When you have that kind of attitude paired with a really, really bright, intelligent, quick-learning kind of mind, the sky's the limit." After averaging 9.7 points and 7.1 rebounds as Gonzaga's top reserve last season, Sabonis now averages 17.3 points and 11.6 rebounds as a starter. The 6-foot-11, 240-pound forward ranks sixth in the WCC in scoring, and he's first in rebounding and second in field-goal shooting percentage (61.4). 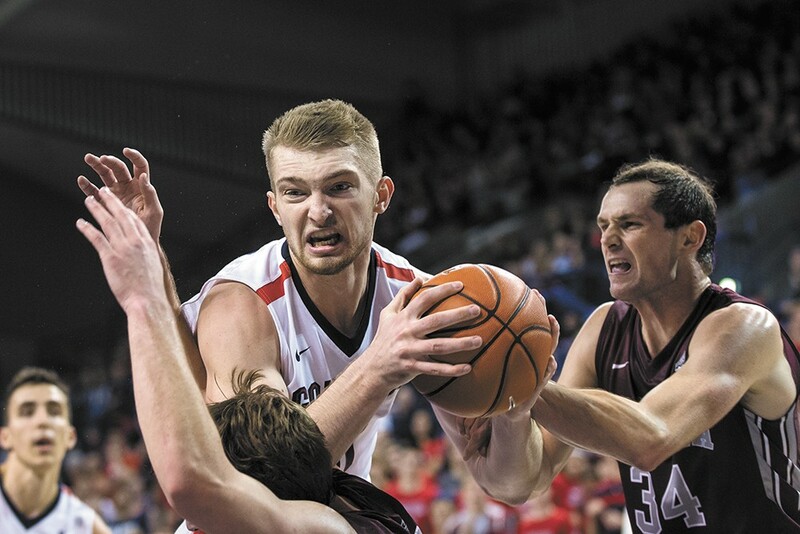 When rebounding, Sabonis attacks the glass like a starving teenager attacks a ham sandwich. "He's just a beast down low," Wiltjer says. "The guy just gobbles every single rebound. "I always tell him he needs to stop stealing them all because I can't get as many," Wiltjer jokes. "The guy's just a fierce competitor, and he rubs off on us." Sabonis spent his early years in Portland when his father, Hall of Fame center Arvydas Sabonis, played for the NBA's Trail Blazers. The family moved to Spain after Arvydas retired from the NBA, but vacations were spent in Arvydas' native Lithuania, and Domantas played on Lithuania's national team last summer. Domantas saw limited action for two years in Spain's top professional league (maintaining amateur eligibility by not signing a contract), then decided, "I wanted to play college basketball, and Gonzaga was perfect." Sabonis was aware of Gonzaga's past success with European big men Ronny Turiaf, Elias Harris and Przemek Karnowski. Tommy Lloyd, the longtime Gonzaga assistant coach and international recruiting guru, helped convince Sabonis to choose the Bulldogs over Oregon, Arizona State and Texas A&M. Not to mention a three-year, $630,000 contract offer in Spain. "I thought Gonzaga was the best," Sabonis says. "Just the family environment, the love when I came here. Tommy was the first one to recruit me. He did a really great job." Gonzaga wraps up the regular season with road games Thursday against San Diego (7 pm, KHQ) and Saturday against Brigham Young (5 pm, ESPN2). The WCC tournament takes place March 4-8 in Las Vegas.